SACRAMENTO REGION, CA (MPG) – Last October, during the last game of their season, the football teams from local high schools Rio Americano and El Camino forfeited the game due to bad conduct — a bench-clearing brawl that ended the season with a lot of bad blood on both sides. After hearing about the brawl, Greg Roeszler was inspired to find a way to turn the situation into a positive for both the players and the game itself. Roeszler — or Coach Roz, as he is affectionately called — has a long history with football: he played at Encina High School and at San Diego State University, went on to play for the NFL, and then eventually returned to Encina to coach the varsity football team. Coach Roz now runs a local non-profit, The Playmakers Organization, that coaches character through leadership and provides free programs to underprivileged and at-risk youth. Coach Roz saw an opportunity to heal the rift between Rio and El Camino through shared service to the community. 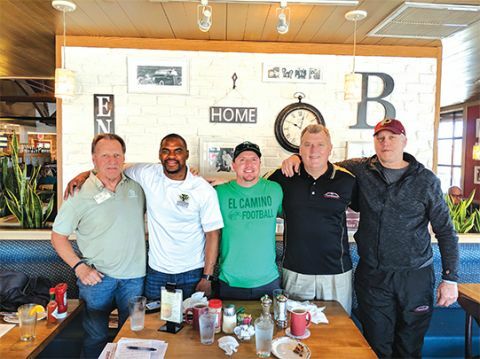 He invited El Camino Head Coach JP Dolliver, Rio Head Coach Sam Stroughter, and San Juan Unified School District Athletics Director Ron Barney to join him and Playmaker Director Phil Dubois at a meeting to discuss a unique idea. Coach Roz suggested that the coaches and selected members from each team work together to serve at the upcoming Tim Brown Playmaker 9-1-1 Camp for Kids on April 12. Barney said the District fully supports the teams “doing something positive for the community and at the same time developing positive relationships between the two schools.” Barney explained that a good rivalry motivates the players to perform at their best and is based on mutual respect. He said teams all over the country deal with this type of problem all the time, and he hopes this could be an example of positive change. “This is big. … It takes people to step up to make a difference. … I think we’re on the ground floor of something good here,” said Barney. Both coaches also expressed frustration with social media, which they believe escalated the rivalry to the point that some of their players were throwing punches on the field. Dolliver said the kids typed things to each other with a screen between them that they never would have said face to face. “These kids are missing out by not treating this rivalry as a positive. … Without Rio, that last game of the season is just another game,” said Dolliver. If you are interested in learning more about The Playmakers Organization or signing up a youth for the Tim Brown Playmaker 9-1-1 Camp for Kids, visit www.theplaymakers.org.